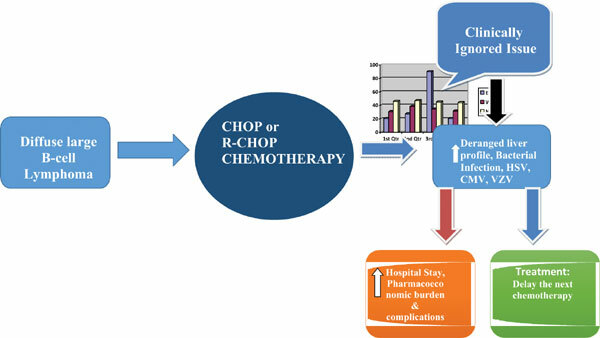 Background: Acute biochemical changes, hepatotoxicity, nephrotoxicity and frequency of infections are common in diffuse large B-cell Lymphoma patients undergoing Cyclophosphamide, Doxorubicin, Oncovin (Vincristine) Prednisone (CHOP) and Rituximab plus CHOP chemo cycles. Eventually, it leads to prolonging hospital stay and suspending the next chemotherapy cycles. Aims and Objectives: The objectives of our study were to determine the changes in biochemical disturbances induced by CHOP or RCHOP and second objective was to compare the effect of CHOP with or without rituximab on the incidence of the infections such as (Cytomegalovirus, Herpes Simplex Virus and Varicella-Zoster virus), bacterial infections and tuberculosis. Materials and Methods: Files were prospectively reviewed during the tenure of 2014-2016. Participants aged greater than or equal to 18 years old with a known case of DLBCL undergoing CHOP or RCHOP chemotherapy were allowed to be included in the study. Baseline and posttreatment patients profile of blood chemistry, liver functions test was collected and compared with the Common Terminology Criteria for adverse events v3.0 2009 CTCAE 2009 and the data regarding infection of Cytomegalovirus, Herpes Simplex Virus and Vericella-Zoster virus, bacterial infections and tuberculosis were drawn from the participant's profile. Results: Patients treated with CHOP therapy showed a significant difference of Alkaline Phosphatase (ALP) (p-value 0.009), direct bilirubin (p-value 0.034) and serum glutamic-pyruvic transaminase (SGPT) (p-value 0.004). Bacterial Pneumonia was only 1 (5%) and 1 (5%) CMV reported positive after the R-CHOP. Conclusion: We propose that liver profile including (bilirubin, SGOT and SGPT) Urea, Creatinine and electrolytes should strictly be considered if found deranged before every treatment cycle and suspend chemotherapy in case of moderate or severe toxicity. Keywords: CHOP, RCHOP, DLBCL, biochemical’s profile, infections, SGOT, SGPT. Keywords:CHOP, RCHOP, DLBCL, biochemical’s profile, infections, SGOT, SGPT. Abstract:Background: Acute biochemical changes, hepatotoxicity, nephrotoxicity and frequency of infections are common in diffuse large B-cell Lymphoma patients undergoing Cyclophosphamide, Doxorubicin, Oncovin (Vincristine) Prednisone (CHOP) and Rituximab plus CHOP chemo cycles. Eventually, it leads to prolonging hospital stay and suspending the next chemotherapy cycles. Protein Kinase CK2 Inhibitors: Emerging Anticancer Therapeutic Agents?